On 6-October 2017 the Cleveland-Cuyahoga County Port Authority signed a historic Memorandum of Understanding with the Maritime Administration of Cuba to outline ways the two organizations can work together to advance trade relations between Cuba and the Great Lakes region. Strategic Assessment – Undertaking a rigorous strategic assessment of our clients’ goals, including export, sales, and investment opportunities. U.S. Regulatory Analysis – Researching and advising on the U.S. regulatory framework to obtain permission to export and/or investment in Cuba. Cuban Regulatory Analysis – Working with clients to manage the regulatory requirements involving the Cuban government. Financing Options – Developing financing options to help facilitate sales and new business. On-Site Analysis – Organizing visits to Cuba focused on making strategic connections for our clients. 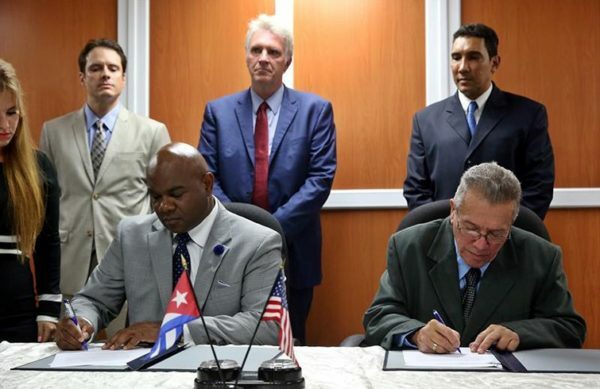 Darrell McNair (seated left), chair of the Port Authority board of directors, and José Joaquín Prado Falero (seated right), general director of the Maritime Administration of Cuba, sign a Memorandum of Understanding on October 6th in Havana, Cuba. Photo: Alejandro Ernesto / EFE.